The more and more time I spend in Paris, I realize further how much I love this city. It easily fits among the ranks of my top three favorite cities in Europe (with Prague, and Florence likely being the other two. Budapest, Berlin, Rothenburg and Zermatt following close behind). 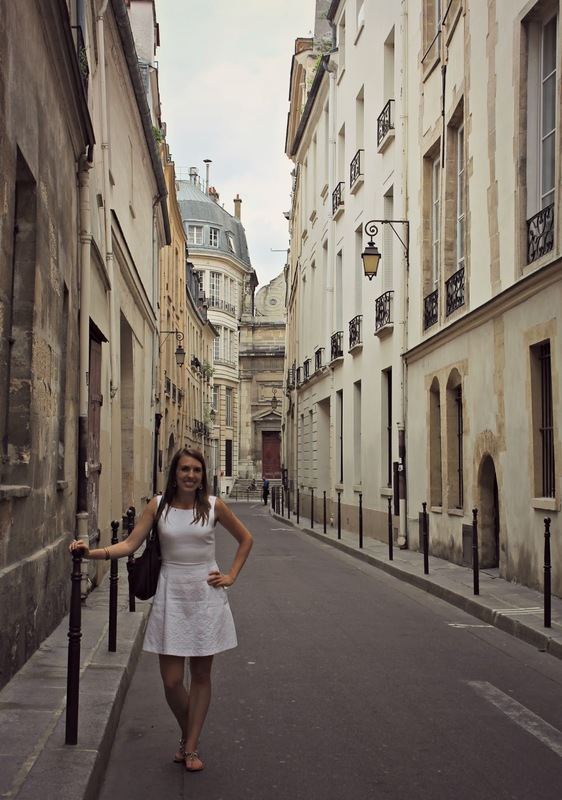 I just absolutely love Paris. Everything, from the look of it, to the food, to the feel of it. If I were to confess something, it would be that while Frankfurt is lovely in its own ways and while I do like it here, it has never had that comfortable, effortless fit in my heart with the feeling of "home." That feeling one gets in certain cities that feels like slipping under a cozy blanket, as though one could easily put down roots and make that place home. I feel like for each of us, we can and do feel this sensation in more then one place, absolutely. Just like there isnt only one person for each of us romantically, there is more than one place that can become "home" in our hearts, for sure. But, by the same token, we don't feel this in very many places. That is the distinction. And its a feeling that comes naturally upon visiting the place, it isn't one we force. Its a feeling of, wow, this place could conceivably be home for me, if I were to move here. I could picture it. Its that kind of feeling. And while I have never felt this in Frankfurt, I have felt it in Paris (as well as Boston ;-) which I continue to feel nostalgic for fairly regularly). So when I stumbled across dirty cheap airfare to Paris during that time my little sister would be here visiting me in Europe this summer, I snagged it. And off we went for 4 days. And I fell in love once more with the city. This is my favorite part of Paris. The district known as Le Marais. Also "St. Pauls Village" is a part of Le Marais. Its just incredibly charming. Sort of shabby chic, old, faded, romantic, low-lit, just awesome. 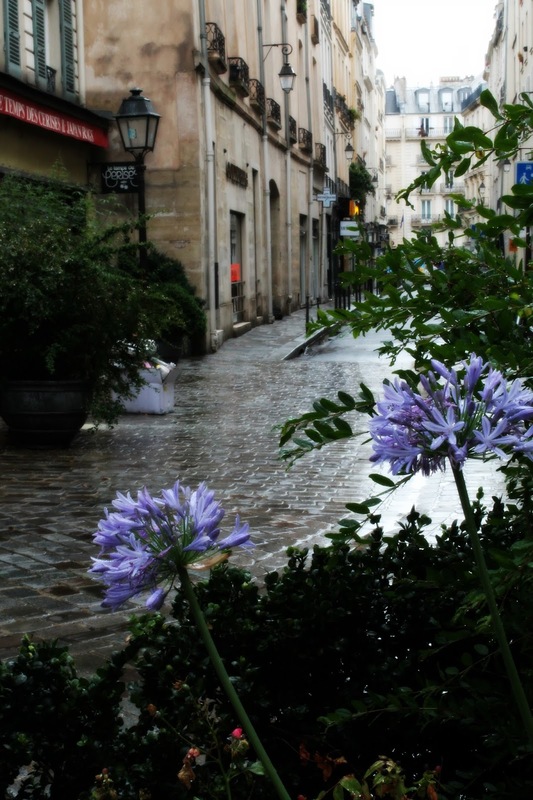 I could wander the streets in Le Marais for hours. 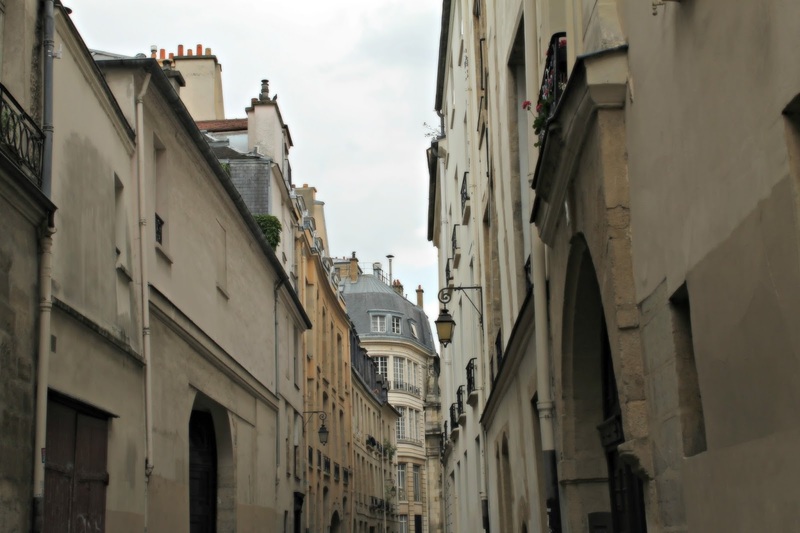 Here is a fascinating and fun article about the 20 Neighborhoods of Paris. What each one is known for, what you can find there, etc. I love Place des Vosges, where I sat for around 2 hours one afternoon both reading and writing in my journal, for many reasons. The square is like a poem, in living action. Its inviting, absolutely gorgeous (the stately red brick and stone buildings surrounding the square are lovely, the fountains quiet rush of water an alluring and lull-inducing backdrop, the abundance of greenery adding to the charm of the entire scene). A small scattering of people fill the park. Couples, little families, young adults sprawled out on the lawn, elderly couples perched on the benches that line the sides of the parks. Children chase pigeons or entertain themselves in the small sand pit in the center of the park. The entire scene is idyllic and totally peaceful. With a great book or two, my journal and a picnic, I could sit here all day. A cool breeze ruffles the leaves. Sun warms the benches and grass. Antiquated street lamps line the gravel paths. An elegant, simple, black iron gate/fence runs along the outside of the park. This entire square is all about symmetry, charm, loveliness, peace, an inviting respite from the bustle of the city outside of it. Murmurs of conversation can be detected alongside the quiet movement of the fountain water. A sound that, like waves crashing on a shore or the rushing of a small river, fills one with a sense of peace and inner quiet. You may find your eyes even starting to close as you sit on one of these benches in the sun, enjoying the scene and becoming a part of it. I was watching this little Parisian family. A mom and what appeared to be her two daughters. She was a total fashion plate ;-). The three of them ate ice cream together. Then the mother and her eldest daughter, maybe age 11 or 12, chatted on the bench while her younger one ran around and played. Way cool chocolate shop!!! I sampled a few unique flavors: violet, rose, earl gray and lavender. Dinner was a much anticipated Croque Monsieur. Mmmmmm. For the first two days of our trip, Lexie and I did our own thing. I spent my first day wandering Le Marais (my favorite district) and hanging out in Place des Vosges. I popped in and out of little boutique shops. I had a mouthwatering late lunch of Croque Monsieur. I ate dinner sitting in front of Notre Dame as the sun set. Fabulous. Cute story: while sitting in front of Notre Dame, awe-inspired by the view and enjoying the scene, I decided to take my first ever selfie. Yes, you read that right. I have never taken a selfie before! I know, so behind on the trends haha. Yes, when traveling alone, I have asked a passerby if they might snap a photo of me. And yes, when traveling with a friend/loved one, we have taken selfies together. But never have I taken a solo selfie myself. I debated it for a moment, feeling self concious and silly. But then decided, ah, to heck with it. Notre Dame is a good excuse for it. The view is awesome. So, I stood up and walked to the back of the square where I hoped no one would see me (unlikely, since there were literally hundreds of people wandering around the square). I positioned the camera, my face blushing, my hand shaking slightly, feeling as though a spotlight was trained upon me. I felt like I looked self centered and silly. But I smile and snapped the photo quickly. As I looked at my phone to see how it came out, a man approached me maybe two minutes later, as I was still looking at me phone. "Excuse me," he said, "I just noticed you from across the square. I saw you taking a selfie, looking a bit self concious. So I decided I wanted to come over and talk to you." At this, I couldnt help but laugh. "Ok, that is hilarious," I told him. "You just caught me taking my first selfie ever! And yes, I was incredibly self concious. And was worried about people watching. So, thank you for re-confirming for me why I have never taken a selfie before and never will again," I said as I smiled at him. He laughed at this and then we went on to chat for 10 minutes or so. He turned out to be from Paris, so we chatted about the city some, while he asked me about myself. Then he asked me out on a date for the next night ;-) really nice, though I turned him down. But the irony of that story (plus the fact that its pretty cute/fun) made it too good not to share. I walked along the Siene river as the sun set and snapped more photos. I watched the city come aglow as night fell. I strolled and enjoyed the atmosphere. And then made my way back to the hotel where I figured Lexie would be waiting, as it was getting late. For my second day out and about in Paris, I explored the area around Canal Saint Martin. I had never been to this part of Paris before. I loved walking along the canal, which was sun-dappled and littered with revelers sitting alongside the water. I walked into more little boutique shops. Snapped loads of photos. I happened upon a delectable Portuguese bakery, oh man, was this great. The bakery is called DonAntonia Pastelaria. The owner is a Portuguese woman who bakes authentic sweets. The interior is charming and inviting. Yes, its small but it works. The inside is bright and cozy. The pastries look fresh and totally delicious. I was walking by the shop and it caught my eye, drawing me inside due to how yummy it looked as well as the elegant, light pastel shades of the shop. I stayed there for around 40 minutes, chatting with a young woman who worked there, Sofia. She was warm, personable and really lovely to chat with. She turned out to be American as well (from NYC), so we found lots of things to talk about and the time began to slip away. I really enjoyed this. And the cake I tried? To die for. It was totally moist and delicious. The cream between the different chocolate or vanilla colored cubes of cake was thick and lightly sweet, fabulous. I considered going back the next day for another one ;-) it was that good. I spent the remainder of my second day wandering around Saint Martin Canal area, snapping photos, ducking into inviting little shops, stopping for a snack here and there. God, I love Paris. It may be my very favorite European city, in terms of: would I live there, the look/feel/vibe, what I feel the city has to offer, basically the whole package. Berlin for instance, is the bomb. Its edgy, hipster, and has an undercurrent of electric energy to it. However, living there wise? It would be too much for me. Its a bit "too cool" (I certainly wouldnt fit in. Ive never been a person my loved ones would call trendy ;-p). Its a tad too much of a party city, too fast, too much for me overall. I LOVE to visit, but I wouldnt want to settle there. It isnt "me" per say. Paris, on the other hand, absolutely is. Its bustling and busy, but not in an overpowering way. More subdued than Berlin. More...quietly loud in its selling points. Paris has an elegance, a calmness, a classiness, that Berlin lacks. All of which draws me to it more so. For me, Paris would offer/has it all. Glamour, class and elegance. History. Incredible food. Ornate, classic, eye-catching architecture. The language is more beautiful. The French dress better. Their parks, which are numerous throughout the city, are works of art in and of themselves. People actually approach you in Paris!!! This NEVER happens in Germany, which is a huge bummer. There is a more refined loveliness to Paris than Germany in general. I feel more comfortable in Paris. Much more at home. It just...fits me more. Stay tuned for Part Two....the second part of the trip during which Lexie and I took a bike tour all over Paris, visited Sainte Chapelle, had a picnic on the lawn of the Eiffel Tower, and I signed up for an authentic croissant-making course!!! I will post this next part within 48-72 hours!! !